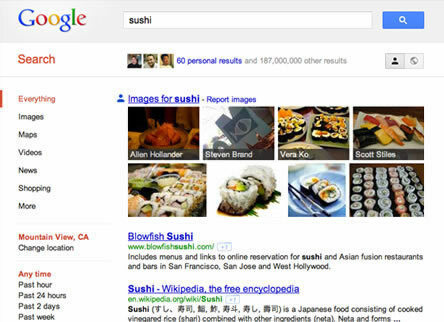 As of today, Google search has just become richer, more social, and more personalized. Google officially announced today that it is incorporating more results from Google+ into search results for users signed into Google+. In its official announcement today, Google introduces three new features for its search engine that combine together (like an internet Voltron) to create the powerful Search plus Your World. The three key features are Personal Results, Profiles in Search, and Related People and Pages. Note: These features are just rolling out now, so they may not be fully functional for everyone just yet. Picasa and Google + have been fused, and photos from people in your circles are likely to show up in your personalized results. 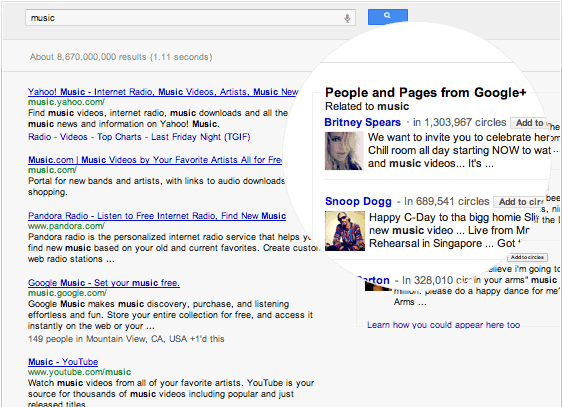 Users can also expect to find relevant Google+ posts from their friends in search results. There will be a button so that users can now turn personalization on or off. Google+ profiles have been integrated with predictive search. When you type in the first view letters of a friend or Google+ superstar, you’ll see an autocomplete prediction for their name. You’ll also see a button to add people to your circles. Google has made a nifty interactive graphic on Profiles in Search. There will be a new results segment displayed on some search results for – you guessed it – related people and Google+ profile pages. “How do I get my profile ranking?” you might ask. I could try to go in detail here, but Google actually does a nice job explaining how to appear as a related person or page. Basically, you need to show your Google+ profiles some love, post frequently, and use the keywords you want to rank for. Google states that personal search results will receive the same level of security and privacy protection as Gmail. In addition, personal results are marked with little icons that denote the search result being Public, Limited, or Only You. You can toggle personalization on or off as well. Like with many of Google’s major recent developments, Search plus Your World is not all rainbows and unicorns for search marketers. Remember the days when you knew exactly where you ranked for a key phrase and exactly what the SERPs would look like when anyone in the country typed in the given search term? Those days are long gone, friends. This makes tracking SEO progress more difficult, since rankings are becoming less and less of a reliable performance indicator. Also, optimizing for Google’s standard search is different from (and not always as valuable as) optimizing for specialized search such as Google Images and Google Places – and now we must add People, Places, and Profiles to the ever-expanding Google search marketing mix. We’ve long known that increased personalization and diversification is a prevailing trend in search results, so we know that multi-faceted SEO plans and higher-quality, more relevant content should be a prevailing trend in SEO – at least by SEO firms that are worth their salt <insert LunaMetrics horn-tooting here>. Making Google more personal and social – when users are logged in – provides another compelling reason to be signed in to Google while searching. Which means more (Not Provided). Every time a person is logged into their Google account and clicks through to a site via organic search, Google Analytics shows the used the keyword (Not Provided) instead of the actual search term they used. We anticipate that Search plus Your World will result in higher Google account usage and an expansion of this black hole of keyword data. Indeed, Google now has Search, plus Your World landing page linked to from its main page, and this alone will likely provide a boost to Google+ conversions. Increased prevalence of (Not Provided) is something we’ve predicted. Unfortunately, there’s not much we can do about (Not Provided) besides whine – unless we want to join together in Mountain View, CA and lay down in the middle of Amphitheatre Parkway. The increased integration of Google+ and search will really help you gain exposure if you are a Google+ superstar or blue chip. Your Google+ profile and page hits are likely to ramp up in the near future, especially if you put some effort into optimizing your Google+ profile and networking (which you should). It appears that the ranking algorithm for Google+ pages and posts is based on keyword relevance and engagement. This likely means the engagement level of your posts and the amount of people engaged with your profile or page. If you already utilize great images and get good results on Facebook or Flickr, you should probably start uploading and sharing your images on Google+. Utilize Google’s authorship program (which will list you as an author in search results and link the name to your Google + profile. Use a nice profile picture on Google+ (author’s profile pictures will show up on search now). Market yourself on Google+ by creating a strong profile and networking. Is Google’s Search plus Your World a momentous landmark in the evolution of the Internet? Is it merely Google blowing hot air in an attempt to breathe down Facebook’s neck? Time will tell. One thing we know for sure is this is a development that is more than worthy of the keen attention of the Internet community. What are your thoughts on Search Plus Your World?